Let’s find out what is a JOIN and how to use it. The main difference between JOIN and UNION operator is that union combines results vertically, while the JOIN combines result's horizontally. There are different types of JOIN-s depending on the business need and we will discuss about them. Since the databases should be normalized it is essential to use joins to get details for some records. In various examples across the internet there are mentioned also other types of join's but the mentioned three are basic and easy to understand. To be able to explain joins on a concrete example we will use two tables. One table will contain a list of persons and the second one a list of some pet types. Like said before INNER JOIN returns those records that have matches in both tables A and B. You need to have a key on both tables that you can join using ON statement. In our example, we can join the two tables using "Pet type" column and find out if our pet like to walk. Since Ivan does not have a pet he will not be returned because there must be a match in both tables. Also, the "Fish" will not be returned because none of our entries does not have a pet of type fish. The LEFT JOIN will return all records from the left table (A) and matched records from the right table (B). If there are no corresponding records on the right side, NULL values will be returned. Just like the INNER JOIN, the LEFT JOIN requires a joining key ON. Using the LEFT JOIN in our example we will get the full list of persons and the "Like to walk" column will be NULL if the person does not own a pet. The RIGHT JOIN does the same job but in reverse. The LEFT/RIGHT join is often used to determinate what values from one table have/haven't pairs in the second table. 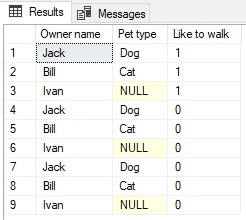 The result of this query would be all persons that don't have a pet, but also the persons with a pet type who does not exist in the "Pet type" table. Just add a person with a new pet type and check it by yourself. Mathematically speaking the CROSS JOIN is a Cartesian Product. It combines every record from the first table with every record from the second table. The CROSS JOIN doesn't need a joining KEY. It can result in a very big data set, so use it with caution. The resulting number of rows will be equivalent of number of rows from the first table multiplied by the number of rows in the second table. The advice is to limit the result set using the WHERE statement, but sometimes this is maybe exactly what you want. When joining two tables you can combine them using CROSS JOIN or just ",". SQL 4 begginers - Alias Alias is a shorten name for a table (sometime even a function) that can be used in queries.